Welcome to our class page!! Our teaching assistant is Mrs Stringer. Phonics Screening Check - w/c 10th June 2019! The following materials will help your child to prepare for their phonics screening check in June. Reading is very important throughout school however in order to develop a love of reading and progress your child's reading ability we ask all parents to read with their children at least 5 times a week. Please ask them questions about what they have read and sign your child's reading diary. Homework will go out on a Monday and must be returned by Friday. There will be a piece of Maths and an English/Topic piece to complete. To teach the children reading and writing we will be following the Read Write Inc scheme. These are daily lessons that teach the children phonics, writing, reading and basic comprehension skills. The children will have a book they will focus on and all their learning will be based on the book they are reading. Your child may not be taught by their class teacher during these sessions. This is a photo of our Read Write Inc sound poster. This helps us when we read and write. We also teach separate Talk for Writing lessons. Talk for Writing is a writing scheme written and designed by Pie Corbett. The children are taught a specific text over 3 weeks. During this time the children learn a text and then adapt and change this text to create their own. The children really enjoy learning new texts and creating actions to help them remember. Ask your child at home to perform their text map to you. Next half term we are learning and adapting a 'Wishing Tale' story. Class 4 rehearsing their story map for The Little Red Hen. Throughout school we follow the Big Maths programme. We do daily CLIC (Counting, Learn It's, It's Nothing New and Calculation) sessions where the children learn basic number skills. Within these lessons we are trying to develop counting skills, fluency and mastery within Maths. Mastery is focusing on deepening the children's knowledge and challenging them to apply their previously gained knowledge to new situations and problems. In dangerous maths we had to investigate which unit of measure we could use to measure the height of somebody in our class! In RE we follow the Come and See programme which has been recommended by the Bishop and written by various Catholic educators throughout our Diocese and across the country. This term's topics include: Special People. Throughout the year the children also have the opportunity to study different faiths and understand how different people live out their religion. Throughout their RE lessons the children are encouraged to ask questions and explore their understanding of the teachings within the Bible. The children hear different Bible stories and are provided with the time to 'wonder' and 'reflect' on the meanings of these stories and how God's word is relevant to us today. Ask your child about their learning in RE and ask them to think about any questions they may have relating to their current RE topic. Our Plate Prayers and our Lenten Promise Tree. 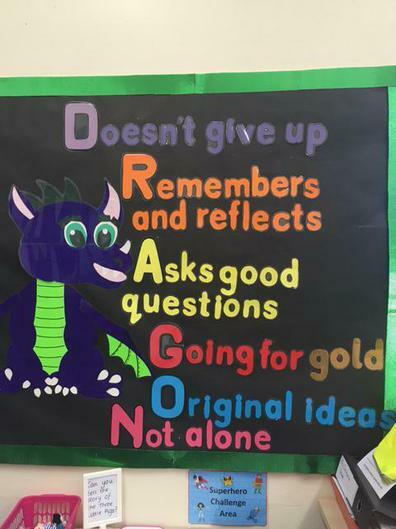 Our DRAGON values are displayed in the picture below. Ask your child about DRAGON. Have they used any of these values today?